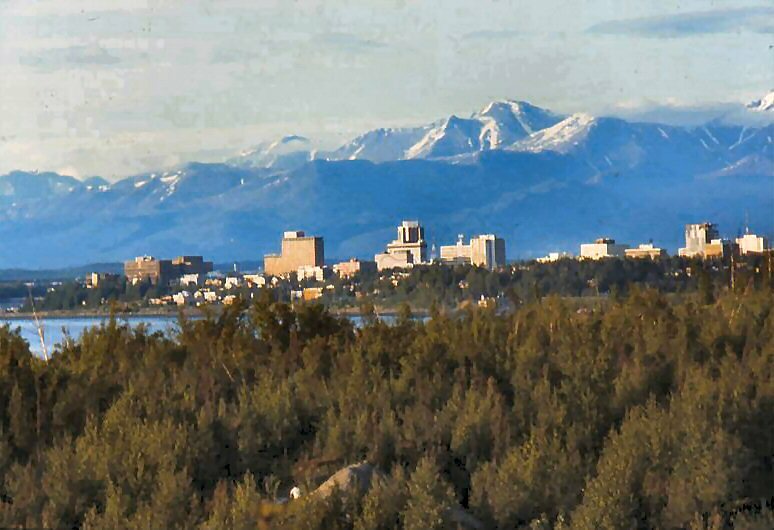 Ten years later in 1974 we arrived in Anchorage. After the Vietnam War, I had been assigned there to fly F-4 Phantom II missions intercepting Soviet aircraft off the coast of Alaska. Our arrival in Alaska occurred in May and it was a shock to see the sun in the sky at 11 p.m., but we quickly accustomed ourselves to this phenomenon. In the winter, the days were only about 4 hours long. The fact of earthquakes was always with us. While we were there several occured, but not on the scale of the great 1964 event. They would often come while I was at work, where the upper floor of our base headquarters would begin to shake. Or while we were in bed at night, when the books on the shelves above the bed would begin to make what my wife called the “ticka ticka noise.” This indicated that a quake was happening long before we actually felt it. On New Year’s Eve 1975, I had gone to the local store to purchase some wine for a party. I had no sooner gotten in the store, when the floor and all the wine and liquor bottles began to shake. This went on for about 20-30 seconds, although it seemed a lot longer at the time. There was little damage to the store — but the thought did cross my mind, what should I do if the windows start to collapse and the shelves fall. This entry was posted in Air Force, Alaska, American History, Anchorage, Earthquake, Norvell Family History and tagged Alaska, Anchorage, Earthquake. Bookmark the permalink. That New Years Quake was in 1974…I remember it well.